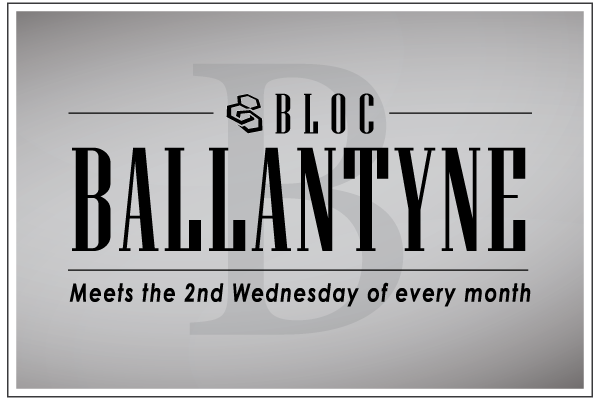 BLOC-Ballantyne meets the 2nd Wednesday of each month. This month they will meet at The Gallery Restaurant within The Ballantyne Resort. Park near the golf side of the building which is on the Ballantyne Commons side. These monthly luncheon meetings are for members and prospective members, where attendees can socialize and share a variety of professional and personal updates. Start time is 11:45am, but members get there early for networking purposes and the meeting ends at 1:00pm promptly. This is a meeting for the MEMBERSHIP and their guests only. This gathering occurs once a month and is a great opportunity for BLOC-Ballantyne members to catch up with one another. Please arrive by 11:45 AM to Network. We begin promptly at 12 Noon and end by 1:00 PM. We will discuss BLOC, BLOC Business, Upcoming BLOC Events and have an opportunity to discuss each of our businesses with the group. Introduce yourself to the door attendant and sign in if you are a member and grab your name badge. If you are a guest, please sign in the guest section with your information and fill out a name tag sticker. Make sure to introduce yourself to the Directors and the Chapter Membership Committee Representative (CMCR) so we know you are there and what industry you represent. Our lunch will be buffet style. If you have any general questions, please reach out the the Chapter Directors; if you have any Membership questions, please reach out to the CMCR.